In the age of the empowered consumer, your customers have come to expect personalized service and convenience. Financial institutions are tasked with meeting their customers’ evolving needs. At the same time, they must streamline operations and drive efficiency. In this quickly evolving and competitive environment, bank CFOs and COOs should embrace opportunities to reduce costs and enhance the customer experience. If you are sustaining your investment in branches, a holistic, end-to-end suite of hardware, systems, and service solutions should be considered. All-branch service is the better bank service solution that offers best-in-class service delivery for all your bank peripheral needs. Why Does Your Bank Need to Invest in a Service Solution? 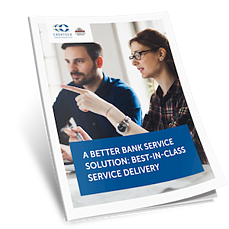 Download this whitepaper to learn more about a better bank service solution.